TSA released a statement today to provide some context and data around the purported “sick-out” and wait times at the nation’s airports. Nationwide, the Transportation Security Administration screened 1.8 million passengers Tuesday. Overall, 99.9 percent of passengers waited fewer than 30 minutes and 94.8 percent of passengers waited fewer than 15 minutes. In TSA Pre✓® lanes, passengers on average waited fewer than 10 minutes. 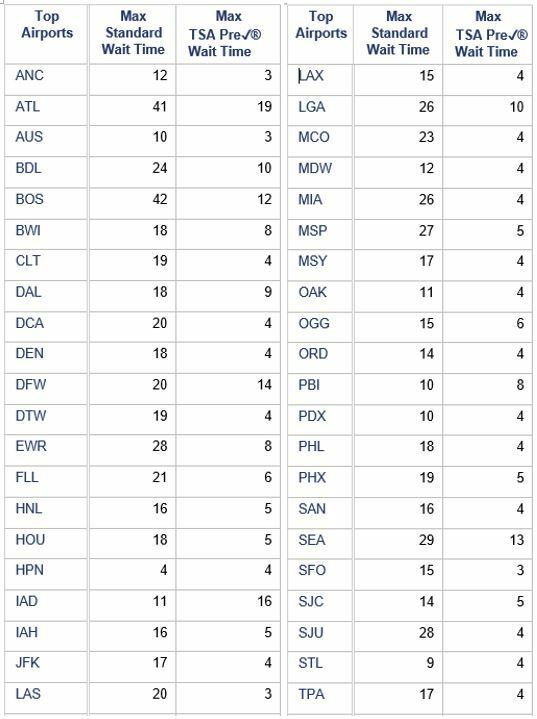 Please refer to the table below for top airport specific wait times. Tuesday’s complete figures show that TSA experienced a national rate of 7.4 percent of unscheduled absences compared to a 3.2 percent rate one year ago on Tuesday, Jan. 23, 2018; many employees are reporting that they are not able to report to work due to financial limitations. In coordination with airport and airline partners, TSA continues to carry out its mission by optimizing resources, managing consolidation efforts, and ensuring screening lanes are properly staffed. Security will never be compromised. Airports may exercise contingency plans due to call-outs and traveler volume in order to maintain effective security standards. Travelers should seek current airline and airport information and should allow enough time to get through the airport and board their flight.